Grange Cottages were built to house employees at the Grange Mill. There are two rows of cottages, at right angles to each other, known as ‘the Brick Row’ and ‘the Stone Row’ – for obvious reasons !! 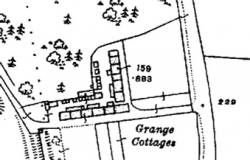 This map, from the OS 25″ plan (sheet 33.5) shows Grange Cottages in 1915. At that time, there were six cottages in each row. The stone row is parallel to the road. It was probably originally built as tenements – flats occupied by cotton spinners and their families. They were converted into cottages during the 19th century. At right angles to Moor Road is ‘the Brick Row’. The cottages were built about 1790. 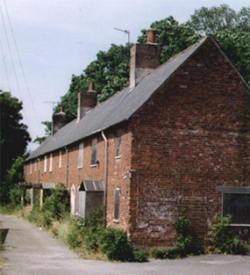 They are an example of the early use of brick for terraced worker’s houses, and are listed by English Heritage. This view shows them before they were renovated in 1996.